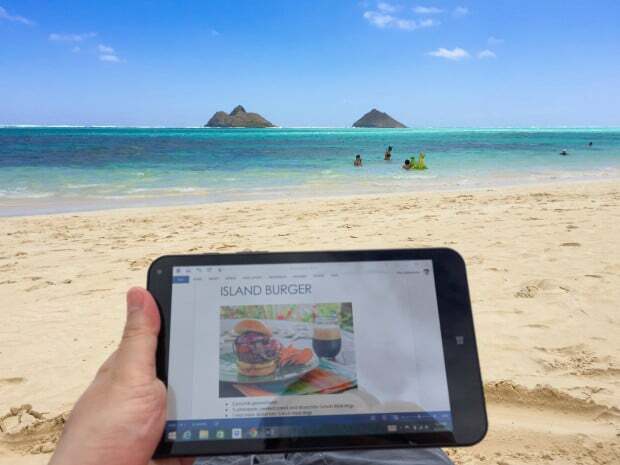 One of the great things about being a full time food blogger is that I can work from anywhere. At least in theory... The reality is that it's not all that different from any other job in 2015. Sure, I get to spend some of my time in the kitchen, but between writing, editing, retouching, scheduling, and social media, not to mention responding to emails and comments, most of my life as a food blogger is spent in a basement office firmly planted to a squeaky desk chair bathed in the cool glow of a monitor. When HP and Intel reached out to me and asked me to work from my happy place using an HP Stream 8 with Intel Inside® I was thrilled to have a chance to change up the scenery. My only dilemma: deciding where my happy place is. For me, I’ve always loved places where air is clean, the sun is shining, and the ingredients are fresh and inspiring… You know… places like Hawaii. I also decided that if I was going to do this I was going to take it all the way, setting aside my laptop and and all the software I usually use to put the Stream 8 through its paces as my work machine. But how could I possibly do any serious work off a tablet you ask? 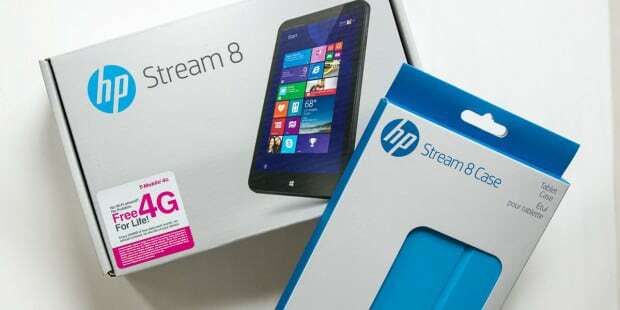 Well, the HP Stream 8 is powered by a 1.8Ghz Intel Atom processor and runs a full version of Windows 8.1. In that sense, this isn’t a tablet so much as a very small computer with no physical keyboard or mouse. This also means that the bundled one year subscription to Microsoft Office 365 isn’t some stripped down companion app, but a full fledged version of Office, just like the one on your desktop. But perhaps most importantly, this $180 tablet comes with a free lifetime T-Mobile 4G data plan, allowing you to get out of the cafe and to work from almost anywhere. With my knife roll and Stream 8 in hand, I headed off to explore the local food scene in Hawaii and to see what it might inspire in the kitchen. 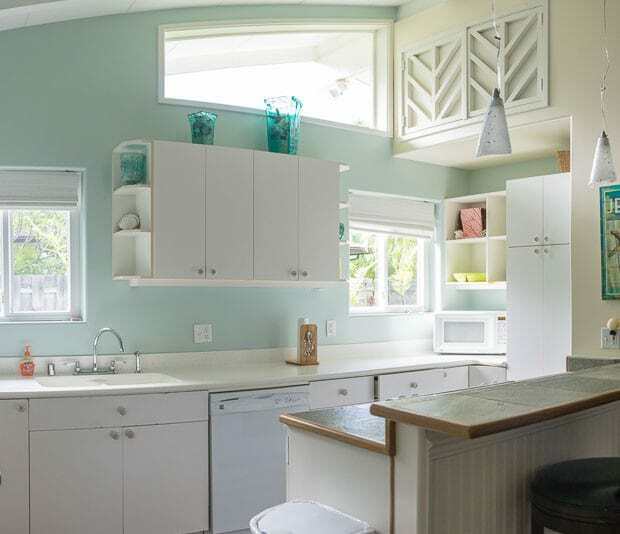 I spent 3 glorious days in Kailua at a cottage that was just steps from Lanikai Beach (yes, that Lanikai). 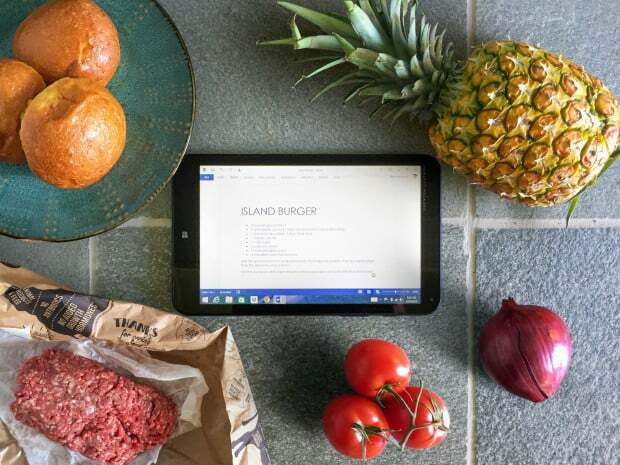 The goal: to create and document a delicious island inspired dish with the help of the Stream 8. 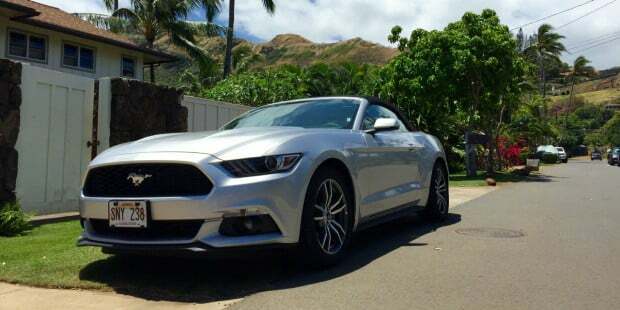 After rolling into Lanikai in style, I spent my first day there hitting up local hotspots like Moke’s Bread Breakfast and Hale Kealoha Restaurant. While Hawaii is literally situated between the US and Asia, the food and culture is as well. Although it’s been decades since I’ve been to Hawaii, having spent most of my life in the US, and the past 4 years in Japan, the culinary culture was both familiar and yet utterly new. After marvelling at the fresh tropical fruits and produce at Whole Foods and Foodland, I came home with a bunch of apple bananas and enough inspiration to cook an 8 course meal. Upon returning to the cottage, I remembered that it was the grill that came with the place that had drawn me there in the first place. Since it’s been nearly a decade since I’ve lived in a place where I can own a grill, I tempered my ambitions and decided to go with a simple island inspired hamburger. The next morning, I awoke to what I can only describe as “the sounds of the rainforest”, and I grabbed a towel, some sunscreen and my Stream 8 and headed to the beach to draft a recipe. Emerging from a short path onto the beach, I literally found myself in paradise. A long beach bookended by idyllic windswept palms, and a vast swath of brilliant turquoise water, which formed a gradation between the white sandy beach and the azure blue sky. Close to shore, a leopard print of live corals broke up the transition into an interesting patchwork of deeper blues, and further out, two islands reached up from the vibrant patchwork towards the sky. I’ve been to beaches on 4 continents and countless islands, but Lanikai Beach is definitely one of the most stunning beaches I’ve ever seen. The most striking aspect of the beach though, wasn’t the natural beauty, but the fact that there were so few people on the beach. 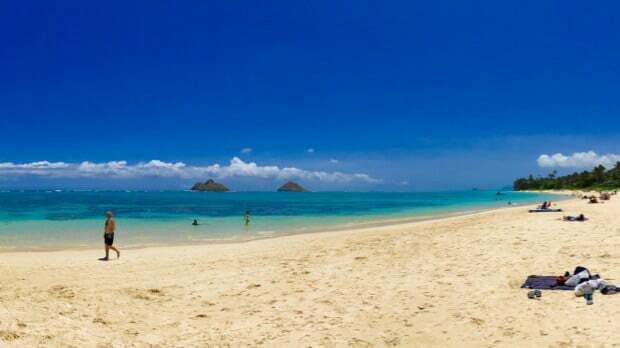 In most places around the world, a beach this gorgeous would be lined with a sea of gaudy beach towels so close together that you wouldn’t be able to see much sand. I staked my claim on an area a good 40 feet from the closest neighbors, and got to work. The Stream 8 comes with a great little app called Microsoft OneNote for taking notes. While it may sound like any other note taking app, it’s more than that. I’ve never been a fan of taking notes the standard way. In school, I often wrote in the margins and drew doodles when I probably should have been paying attention to a lecture. I guess you could say I was a visual learner. 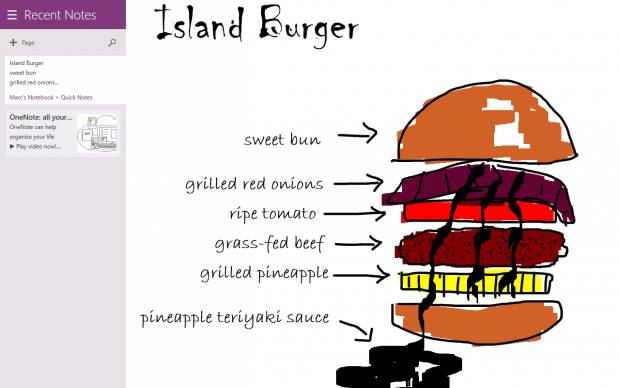 OneNote lets you draw pictures inline with your notes, and it didn’t take me long to have a rough(okay, very rough) draft of my Island Burger. Concept done, I opened up Microsoft Word and started drafting a recipe. By the time I started feeling toasty, I had my concept and draft recipe done, and took a quick dip in the refreshingly cool water before heading back to the house to change and go grocery shopping. 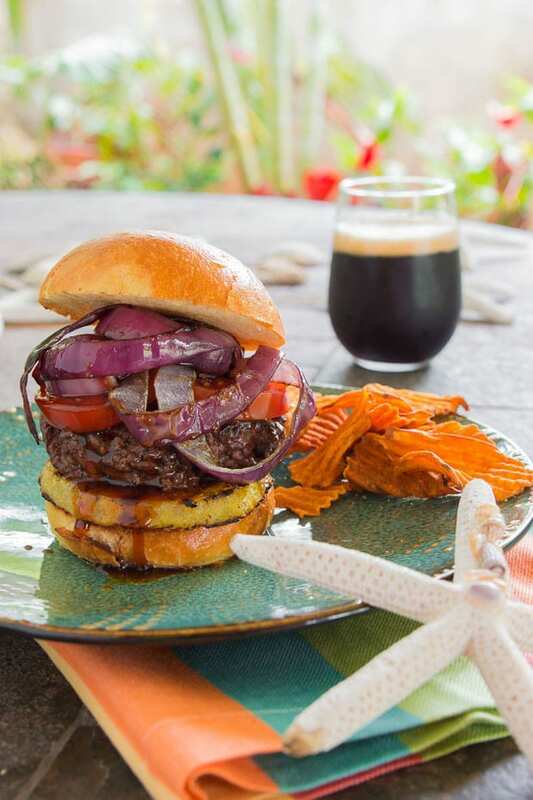 With a few pounds of grass-fed Kualoa Beef, a seductively sweet smelling local pineapple, some onions, tomatoes and a pack of coconut porter from Maui, I headed home to grill up my take on a Hawaiian burger. The assembled burger was epic. Honestly, I think I may have to rename my Best Hamburger because this was quite possibly the best burger I’ve ever had. With textures running the gamut from crispy to crunchy to crumbly to juicy, a sublime balance of savory, sweet and sour tastes, and the intense flavor of beef amplified by the teriyaki sauce, this burger was simply divine. Paired with the nuanced toasted coconut porter and the blissful tropical setting, I couldn’t help but smile, knowing that I’d found my happy place. P.S. Before I leave you to go make your own burger, let me share one more photo with a secret ingredient… Any guesses what it is? Yep… I know I’m always preaching about avoiding processed foods, but this is probably only the second time in my life I’ve eaten this, and I felt like I needed to try it out in this burger to keep it real (in a paradoxically fake kind of way). While I’d never tell you to go out and buy a can of this stuff, I can say that it’s pretty damn amazing in this burger… if you know… you happen to have a half-eaten block sitting in your fridge. P.P.S This post was sponsored by HP and Intel, but as always the opinions expressed are my own. Split the beef into 4 pieces and shape into patties that are a bit larger than the buns as they will shrink as they cook. Salt and pepper the patties. If your ground beef is very lean (less than 10% fat), then you'll want to drizzle a little olive oil onto the patties. Put the onions in a tray or bowl and drizzle with olive oil, flipping a few times to coat evenly. If you have skewers, pass a skewer through the center of each slice of onions to keep the rings from separating on the grill. Peel the pineapple, and then cut into 1/3-inch thick slices. Use a small cookie cutter or paring knife to remove the core. Drizzle with olive oil. To make the teriyaki sauce, add the sugar, pineapple juice, and soy sauce to a small saucepan and boil until the mixture has reduced to about 30% of its original volume and it's about the thickness of maple syrup (the real stuff). Remove from the pan from the heat and set aside. Put the hamburger patties on the grill along with the pineapple and onions. Let them all get grill marks on one side and then flip over. Use an instant read thermometer to tell when the burgers are done. When the burgers are almost done, split the buns, and toast them on the grill. To assemble, put the grilled pineapple on the bottom bun, followed by the burger patty, tomato and grilled onions. Drizzle a generous amount of teriyaki sauce onto your island burger and top with with the top bun. 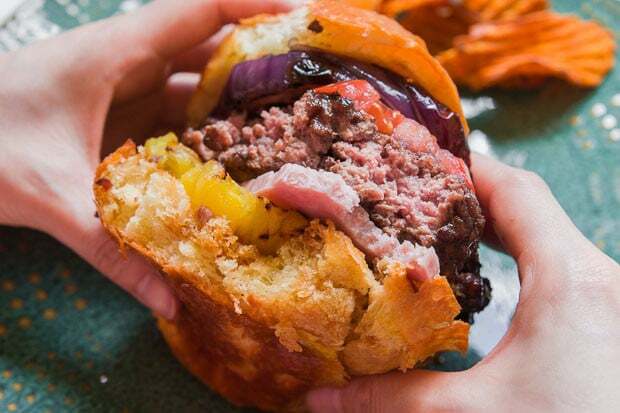 I want THIS burger now. I really hope that secret ingredient isn’t spam! Oh, I don’t care what anyone says, SPAM is da bomb, LOL! Come on, there is nothing like SPAM musubi’s! Sorry I grew up on spam, and it is not a favourite. Spam!! Spam fried rice, spam musubi, spam, eggs, rice & kimchee, spam I am in a Matsumoto island burger!! Spam, pancakes & maple syrup too…. It worked in this burger because the the rest of it was relatively sweet, so the salt helped balance it out. That said, you could really use any kind of ham and get the same effect. What a coincidence! As for the Big Island, I really wanted to make it out there, but my trip just wasn’t long enough. Da kine grindz broke da mouth! Actually my happy place is on a trail in Montana de Oro state park in California. Right above the big break looking at the ocean…ahh. Hope you enjoy it! NZ is a magical place, hope you get a chance to check it out. Hi Kris, I can’t remember, it was either Foodland or Wholefoods. You’re welcome 😉 I’m with you on Montana de Oro, love the tide pools there. Awesome! Where haven’t you been? My happy place is the 2nd day of a trip somewhere new. When I take a deep breath and soak in everything new and beautiful around me. It’s been on a lake in Maine, the bay in Miami beach, the narrow streets in Tzvat Israel and soon, Eastern Europe. Each of those places I think about the things I saw and the great food I ate to take me back. Haha mark when I looked at the photo of the burger I was wondering what that pink slice was and thought “is is ham? No. Is…” So I scrolled up to the picture diagram to see if you listed the secret ingredient but you didn’t…so I read the paragraph underneath but you didn’t divulge it. but haha being from Hawaii I totally know exactly what that is! I’ve never seen it in a hamburger before, even here, surprisingly. Hi Eyeswiseopen, I think adding cheese would be fine and theres a wide variety of cheeses that should work, anything neutral cheese like Muenster, Provolone or Jack should work great, and if you feel more daring Cheddar or Gruyere/Comte should work as well. The only cheese I would avoid would be any kind of blue cheese such as gorgonzola, stilton, roquefort, etc.